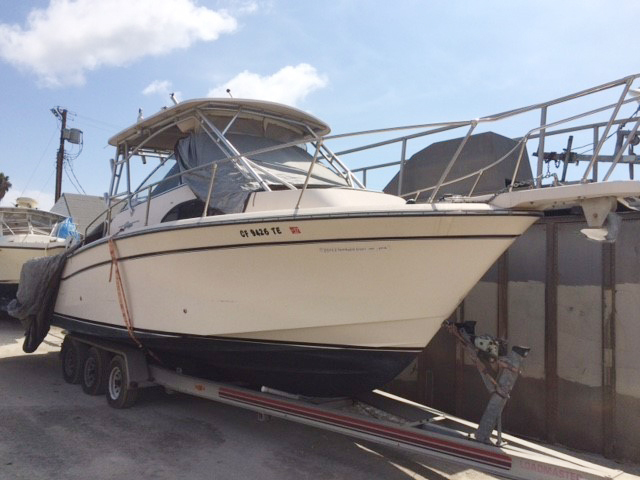 2006 30′ Grady White Marlin 300 Center Console, 1996 26′ MacGregor Sailboat, 1999 21′ Crownline Boats 210 CCR Cuddy Cabin, 2002 29′ Sea Ray Amberjack 260 Express Sport Fisherman, 1999 31′ Century 3000 CC Center Console Cuddy Cabin, 1989 33′ Tiara 3300 Flybridge Sedan Fisherman, 1996 28′ Mako 282 Deluxe Center Console and Outboard Engines. Step #1 – New Bidders: New bidders please REGISTER HERE to create an account*. Step #2 – Register To Bid: Click on REGISTER TO BID next to the specific auction you are interested in. Step #3 – Submit Photo ID: After completing Steps #1 & #2 you will see on your account, “REGISTRATION PENDING” until the completion of Step #3 and you have been approved to bid. For each auction, bidders must submit a copy or photo of their Government-issued PHOTO ID (i.e. driver’s license, passport…) via email. Email photo ID to registration@cwsams.com. Please include what auction you are registering for in the email Subject line. Step #4 – Registration Approval: Please allow up to 24 hours from the completion of Steps #1-#3 for bidding approval. For questions on auction registration, please email registration@cwsams.com or call 855-463-3183 ext. 2. Email us at service@cwsmarketing.com or call 855-463-3183. It’s the Buyer’s responsibility to understand & comply with the complete Terms & Conditions of the sale. *Please Note: End times are staggered every 2 minutes. For example Lot 1 ends Wednesday at 11am, Lot 2 ends at 11:02am, Lot 3 ends at 11:04am and so on. Lots offered by the IRS-CI are noted in the catalog. The IRS-CI reviews all bidders for IRS-CI offered lots and approval may take up to three (3) business days. This does not change the requirements for payment. Please call ahead before pickup to ensure that the IRS-CI has approved your purchase. Some merchandise in this sale has a reserve price. When the auction closes, each lot will display either SOLD or ENDED. SOLD indicates the reserve (if there is a reserve) was met, and a payment email will be sent to the high bidder. ENDED indicates all final bids did not meet the reserve. In this case, CWSAMS will ask the seller if they will accept the high bid. If the seller accepts the high bid, an email notice confirming the approval will be sent to the high bidder, along with payment instructions. All items must be paid in full within 48 hours (2 business days) from time the bid approval email is sent by bank wire or cashier’s check only. Cashier’s checks are made payable to CWS Marketing Group, Inc. See terms of sale for submission details. For lots that do not meet reserve, and the bid is approved after the sale, the Buyer will have 48 hours from the time notification is sent to make final payment. Removal is the responsibility of, and at the expense and risk of Buyer. CWSAMS, nor the agencies represented, ship any property. If shipping is desired, it is the sole responsibility of the buyer. Therefore it is strongly recommended that buyers look into shipping arrangements prior to bidding. For aircraft, removal must be completed on or before the 7th business day from the date the buyer receives the FAA Bill of Sale. Removal is by appointment only and should be made by the Buyer with the storage vendor only after Buyer has received the necessary Property Release Document. Please see Removal Details for complete removal information. Find answers to common questions about bidding at an online auction. Contact us at service@cwsmarketing.com with any technical questions about the online bidding process. CWSAMS has made every reasonable effort to facilitate online bidding. However, it is possible that technical problems and transmission issues may arise and affect the CWSAMS website, bidding system and/or computer or server or your computer, personal devise or software which is beyond the control of CWSAMS. By bidding online Bidder acknowledges that CWSAMS is not responsible for technical problems or transmission issues associated with a bid and that, in the event technical problems interfere with or prevent a bid, it may be necessary to withdraw items from bidding due to technical errors or uncontrollable circumstances. Further, in the event of the occurrence of a technical problem during any bid in any auction, CWSAMS in its sole discretion reserves the right to declare an item sold, postpone or cancel the auction, extend the bidding time for this auction and/or re-list the property for auction at another date and time. The decision of CWSAMS on this matter shall be final. Bidder acknowledges that, by bidding in any auction held by CWSAMS, Bidder accepts the terms and conditions of this Disclaimer. SIGN UP TO RECEIVE EMAILS ABOUT UPCOMING AUCTIONS! You can place your bids online through our bidding platform!